Update 2-24 0800hrs: 200 acres - 50% Containment, Good progress made overnight. Update: Three homes remained threatened as fire spotted across drainage; and hit the ridge. Calfire spokesman Daniel Berlant says the blaze, which was reported a little before 1 p.m. Thursday, has consumed about 40 acres in an area of steep hills and thick brush. Berlant says strong winds are helping to fan the fire, while dry brush has been providing fuel for the blaze. Winds should begin calming. Conditions: Steep hills and thick brush. 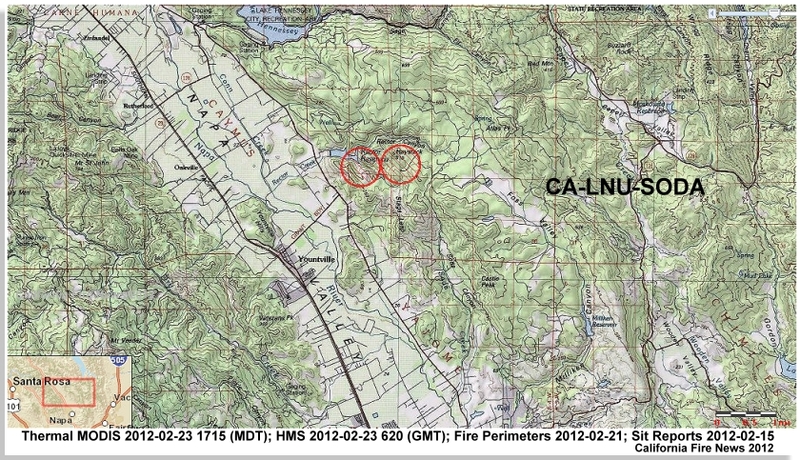 Structure Threats: Yes, three homes remained threatened. Resources: 200+ firefighters on scene, Napa County E-2, E-10, E-217, WT-25, LNU Dz 1446, Dz 1442, Crews on order.